The 2018 midterm elections were historic in many ways (read our synopsis), but there’s one special way they were historic specifically for our firm. Nate Cohn of The Upshot / New York Times ranked for accuracy all pollsters with public surveys in the final three weeks of the elections. Cygnal led the group as the most accurate pollster in the country based on the unbiased analysis of the New York Times’ crazy-smart polling and data wunderkind! While we’re still trying to pick ourselves up off the floor from shock, we trust our data and know it’s the best out there. Polling is a whole lot of science, but there is also an art to it. At Cygnal, we have figured out there is significant room for innovation and improvement in the space. We used the 2018 midterms to test several theories we had about turnout modeling, sample collection, and mode blending. Now that the elections are over, we are already knee-deep in analysis of the data we collected, the turnout composition, and the lessons we can learn from both to take into 2019 and 2020 races. Some of the early indicators show a wildly different electorate than previous midterms, which points to an unprecedented 2020 election cycle. Political campaigns, committees, and independent expenditures must invest more and invest earlier in studying who will turn out and why. Just running surveys to find out where the race stands and what messages may move someone aren’t going to cut it moving forward. 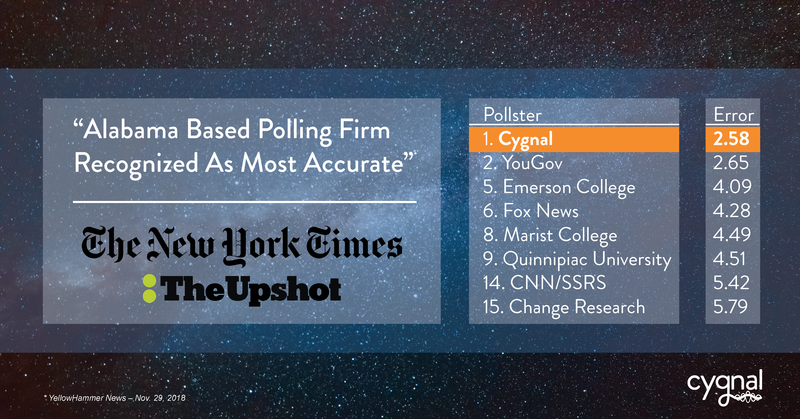 We didn’t earn the badge of most accurate polling firm in the country by playing it safe or relying on tradition. We also aren’t resting on our laurels and enjoying the accolades (just kidding, we enjoy the attention), because that won’t lead our clients to victory next year in Louisiana, Mississippi, New Jersey, Virginia, and Kentucky or nationally in 2020. This year was incredible for our firm in many ways. We conducted more surveys than in the last six years combined (read: how we transitioned from a do-it-all firm to a research company), interviewed hundreds of thousands of voters, analyzed gigabits upon gigabits of data, generated thousands of reports, and held an unspoken number of conference calls that we will keep private as to not re-live the sheer volume thereof. Thank you to our incredible clients, partners, and team for making this cycle our best yet. Bring on the next one! We’re ready.